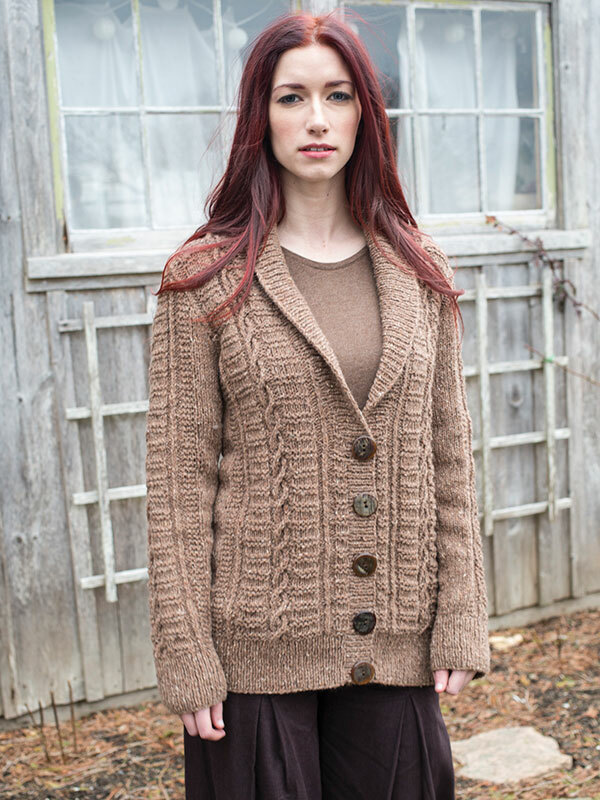 Are you getting ready for our Berroco Tuscan Tweed Knit- or Crochet-along? Let’s take a closer look at the yarn we’re using. I’m going to be knitting Bearberry for this activity. I’ve been in love with this pattern since I first saw the sample we photographed and wanted my very own. But I put off knitting one because I knew we’d have our K/CAL, and what better way to have fun while knitting than to do it as a group activity? So for today’s post, I’ll be talking about my experiences knitting my Bearberry swatch. The sample in the booklet was knit in color #9063 Columbine, but I’m using #9034 Nightshade. I had a lot of deliberation over using Nightshade, or Columbine, or #9031 Oak, or #9055 Cherries… I really like all the colors of Tuscan Tweed. I used the needles called for in the pattern—US size 7 (4.5 mm) needles in stockinette stitch, knit in the round (because the pattern is mostly worked in the round) and washed my swatch last night before laying it flat to dry. The pattern gauge lists 20 sts and 28 rnds in 4″, but my gauge is a little looser. I’m getting 18 sts and 24 rnds to 4″. I did some quick math and I think it will work out at my gauge without a lot of issues. I was going to knit the 52″ size in Bearberry, so I used my gauge numbers to figure out which size to knit. (Yes, here lies a little bit of math.) The final number of stitches in the pattern, for the size 52″ body, is 262. I’ll divide that number by the pattern gauge for stitches to the inch (20 stitches divided by 4″ = 5 stitches to the inch). Then I’ll take that number and multiply it by my gauge. I’m getting 18 stitches over 4″, so I’m getting 4.5 stitches to the inch. That number is closest to the 238 stitches used for the 48″ finished measurement, so I’ll use those pattern numbers to knit my Bearberry. So now that I’ve got my swatch done and my pattern numbers chosen, let’s talk about the yarn itself! After it’s washed, Tuscan Tweed is a really soft, cozy yarn. I know some people have sensitivities to mohair, but the yarn is mostly wool (65%) with 25% viscose and only 10% mohair—just enough to add a touch of fuzzy warmth but not enough to be itchy like mohair can be. Since my swatch was knit in the round, I could slip my arm in it to see how scratchy it might be, and it’s not scratchy to me at all —I would feel comfortable wearing this against bare skin. As I mentioned in the K/CAL launch post, we’ve got a great collection of patterns designed especially for this yarn. But since you can knit or crochet any pattern you want, you can also look at some older patterns—especially those written for Berroco Blackstone Tweed, such as Blish, Red Clover, or Flaherty. You want to find a pattern that lists a worsted weight yarn with a gauge of 18–20 stitches in 4″ or 10 cm. And you don’t have to choose a sweater pattern—I’ve just got cozy sweaters on the brain. 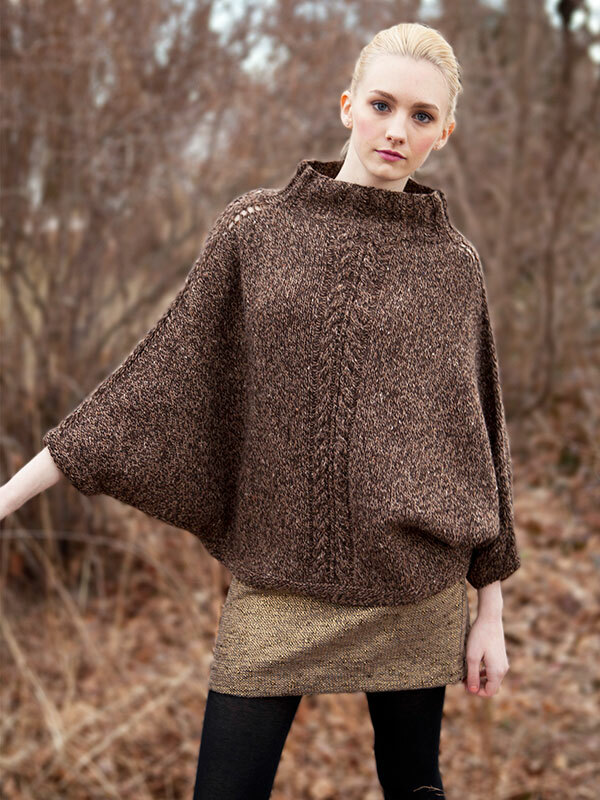 What will you be making in Berroco Tuscan Tweed? Does anyone have a skein of Blackstone Tweed color2661? any dye lot. I am almost finished with a sweater and need it desperately. I don’t even need a full ball.